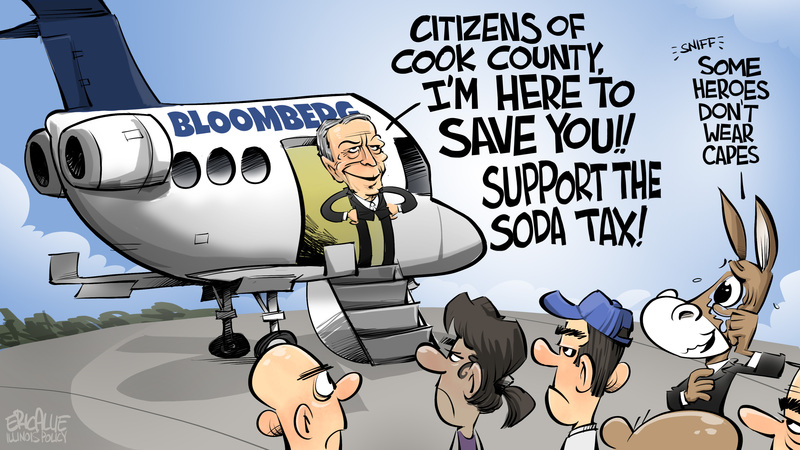 Well, we already knew Bloomberg was shelling out loads of money to support the Cook County Soda Tax. But now we have an Eric Allie cartoon for it. PLEASE, PRECKWINKLE, DON’T CUT SPENDING! NOT THAT! This has got to be the most amusing threat from a politician ever. Before I get to the text – who exactly is going to be threatened by this other than those who work for the county? I’m sure all the government folks are on board with the soda tax (except to the extent it threatens their keeping office). The people who hate the tax will be saying: well, why didn’t you just cut 11% to begin with? We want you to spend less! “President Preckwinkle has failed to do the hard work to reform” county government, said West Side Commissioner Richard Boykin, who had been considering running against Preckwinkle in next year’s election but last week said he instead would seek a new term. If she had done what she should, only “a small hole” would exist that could be filled from other sources, Boykin said. Rizki’s note came just days before Preckwinkle is due to unveil her fiscal 2018 budget on Oct. 5 and barely a week before the board’s Finance Committee is scheduled to vote Oct. 10 on repealing the tax. Oh, I look forward to that budget. I can just imagine the sugar-fattened budget using projections of the soda tax that won’t materialize, even if it’s kept in place. Instead of threatening, Boykin said, Preckwinkle should be taking steps such as reclaiming funds for budgeted but unfilled jobs throughout county government, “holding the line on wage increases” for both union and administrative workers, and selling some of the county’s receivable for debt in the health system. Boykin suggested the latter would enable the county to net $20 million to $30 million on $90 million of overdue bills it might never collect itself. Preckwinkle spokesman Frank Shuftan said that if Boykin “has any ideas that make sense and are rooted in real math,” he ought to put them forward. Sounds like he just did put something forward. I mean, it’s obvious from the piece above. Cook County Board President Toni Preckwinkle on Wednesday refused to forecast the outcome of a vote next week that would roll back the a controversial “soda tax,” or whether she would veto a repeal if one passes. But a day ahead of making her budget address to a Board of Commissioners said to be lined up for a close vote on pulling back the county’s penny-per-ounce tax on sodas and sweetened beverages, Preckwinkle was not shy about saying what would happen without the estimated $200 million in tax revenue projected to come from the tax. “(We will) make significant cuts to public health and public safety, because that’s where 87 percent of our money goes,” Preckwinkle told reporters, following an unrelated press conference on criminal justice reform. Preckwinkle will release her budget at 10 a.m. Thursday, an hour before her formal budget address. The county board could vote on repealing the tax on Tuesday. Yeah, whatever, Preckwinkle. Throw your hissy fit. The soda tax is just spitting into the wind that is Cook County pension issues. Yes, I know that 60% funded ratio may look pretty sweet compared to .. well, all the other Illinois pensions other than IMRF. But it’s not in a great place. I just saw the prettiest political ad about the Chicago soda tax and I wish I could find the video cause it was honestly hilarious. BAAAH!!! Pointless to try to convince the commissioners to repeal this SODA TAX now that Bloomberg lined their pockets. Mike Madigan is it. I think that M.C. RUDE guy has strong feelings about the soda tax. What do you think? Chicago soda tax may have much to do with this. This woman fighting with a canvasser over the proposed soda tax is speaking my language. Not including this one, that is. I will be here as long as the soda tax is. WOO.